There are some incredibly talented individuals who can easily decide which machine to run a particular job on. Or when it’s time to replace that old vertical mill with a horizontal. Then there is the rest of us. For us we use machine data collection to help make those decisions. 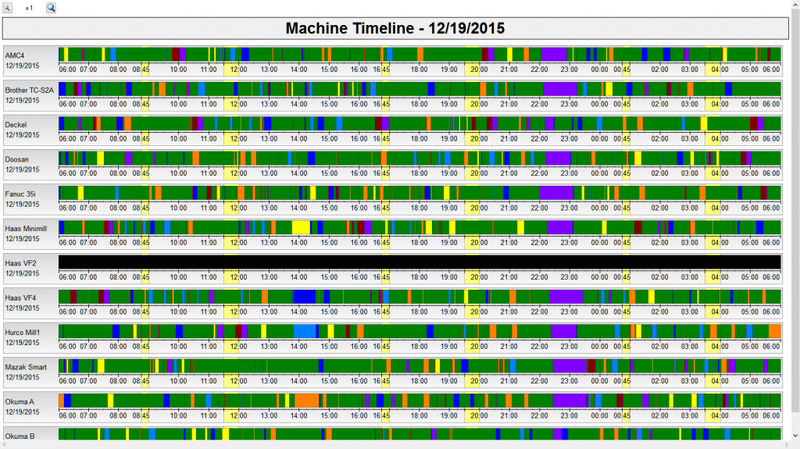 We learn what our average cycle time is by part, machine, operator and shift. We know when their is a bottleneck not because we happen to be in the right place at the right time but because the report tells us exactly how bad it is. We know their is a training issue before an operator has to confess that they are having a hard time setting up a certain job. We have the big picture of how we stack up against industry standards of Overall Equipment Efficiency (OEE). We know all this because we use the flexible and mature CIMCO MDC-Max product to give us actionable data and produce more parts in an informed fashion by using the right machines and replacing machines that are no longer making us money. With both web and windows clients you can also support an environment that is not just Windows workstations including Mac OSX, smart phones, tablets and anything that can run a web browser on to access live screens and operator panels. 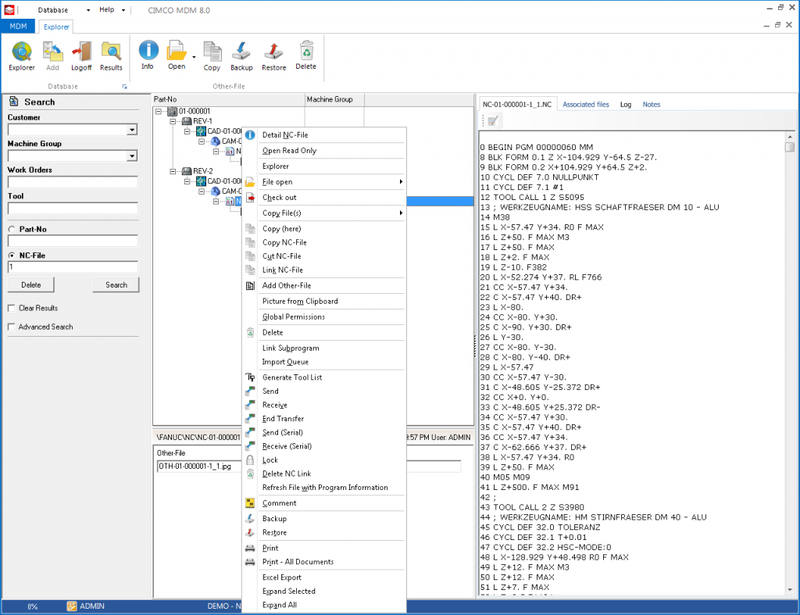 When you need to send and receive files to your CNC machines, you might just use a USB stick, a network drive, some basic DNC software like the one built into CIMCO Editor, or even a floppy drive if you have some very old equipment. Each method has it’s drawbacks and efficiency challenges. Without getting into all the merits an downsides of each method, let’s state the obvious one. They are all different. Chances are you have one or more CNC machines in your facility that you use a different method to send or receive files from. It doesn’t have to be that way, DNC-Max will allow you to consolidate all of your machines on one platform. Before you invest in hardware to allow you to communicate with an individual machine, keep in mind for a very limited cost you can add almost any machine to a DNC-Max installation. More importantly, you will be able to take advantage of translators that allow you to alter files, add specified code or comments based on that machines unique needs or even alter the nc code to adapt to extra features that are available such as conveyors. 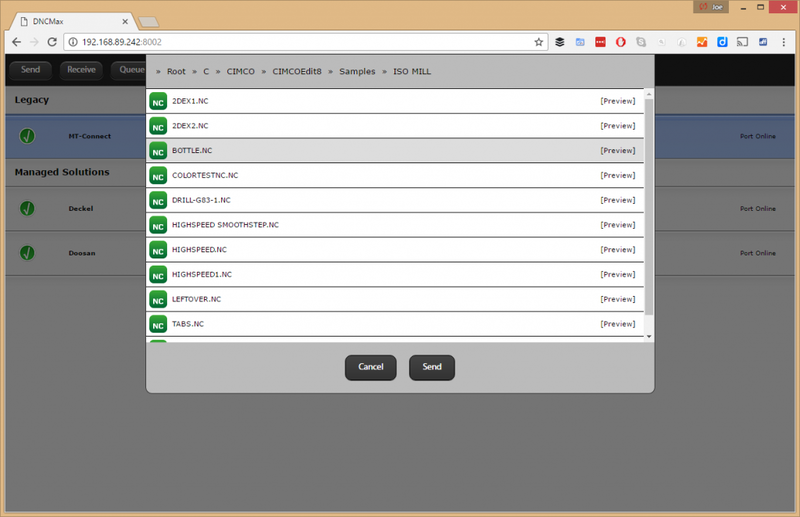 Like MDC-Max there is also a web capable client for any device that can run a web browser. Many of the main software vendors support the precision manufacturing industry can deliver NC-Editing, DNC communications and machine data collection. That list shrinks when you add paperless manufacturing, production data management or manufacturing data management to the list. The list shrinks even further when you take a deep dive into the features of other data management products and compare them to CIMCO MDM. 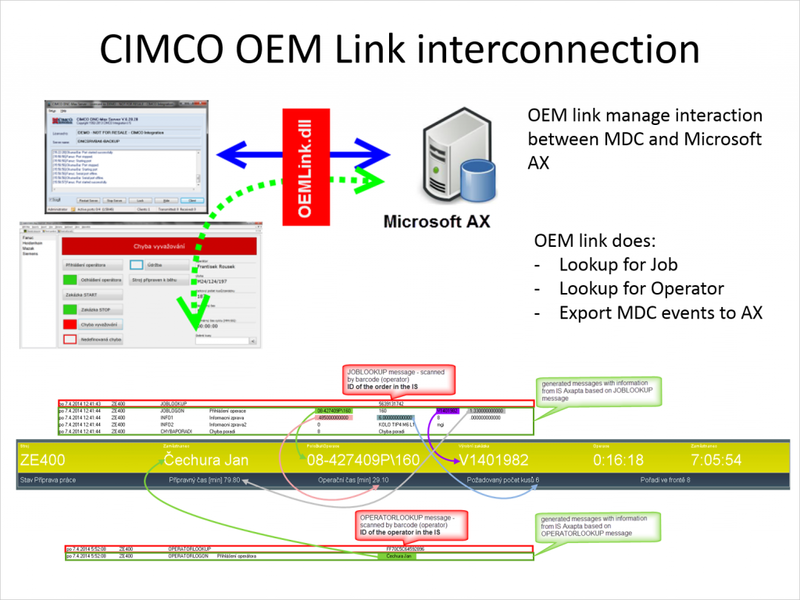 CIMCO MDM is the most powerful and flexible product on the market. By offering deep integration with CIMCO DNC-Max, MDC-Max and a number of CAM software such as Esprit, Top Solid Cam, Edgecam, Solidcam, Mastercam, and others it uniquely positions CIMCO MDM as the best product to use to implement paperless manufacturing into your environment from top to bottom – sales, quality, engineering, and production. Like DNC and MDC-Max MDM also supports web clients to simplify access to the system using any PC or tablet.. Beyond the family of CIMCO products what good would it be if you couldn’t integrate with existing software that is central to your business? Why should you have to re-enter data multiple times or create new entries for data that is already available? With a specialized but wide spectrum of products CIMCO has always built their products with integration in mind. They offer a number of great avenues to utilize outside data and offer the capability to push and pull data from these systems and access outside programs in effective ways. By utilizing a real database and offering an API and OEMLink solution integration with just about any system is possible. Systems like SyteLine, JobBoss, Microsoft Dynamics and others are documented to reduce duplicate entry and take advantage of information that is available without user intervention. The more CIMCO products you utilize the capabilities increase for each product in the food chain. For example if you use CIMCO DNC-Max and CIMCO MDM you gain the control to prevent files being sent to a given machine that have not been explicitly approved and verified by an individual with the rights to do so. When using CIMCO MDC you gain the ability to automatically update the livescreen based on the last program that was sent. The tight integration and wide range of products means you have one vendor to work with to resolve a number of different production enhancements. How many of you have bought a PDM software from one vendor and MDC from another only to find out that it is extremely complex to integrate the two? Seamless integration is possible by taking advantage of the range of CIMCO products available to you. These products are not addressed in this article but all play key roles in solving common problems that many precision manufacturers face. One size never fits all, and it’s boring too. Technology moves very rapidly often generating new opportunities today that didn’t exist yesterday. It is what makes this industry fun and rewarding to us. With everything we’ve already described there is a entire additional world when you share your unique problem with us. That is an opportunity for us to have fun and satisfy your requirements at the same time. If you’re being told something can’t be done, it probably means that person or group just doesn’t want to do it. Give us a call at +1 925-272-0384 and let’s talk about it. At the end of the process we’ll both be better off for it. Thanks Doug, appreciate you checking out this article and sharing your CIMCO Editor experience with people! Hi Joe, really admire the above praise for Cimco. It is a brilliant software indeed. Is there anyway I could get in touch with you for some help related to a couple of features in Cimco Backplot? I’m struggling with an issue and haven’t found any solution on forums and online sites yet. Hello Sebastian, we have been in touch, glad to assist.